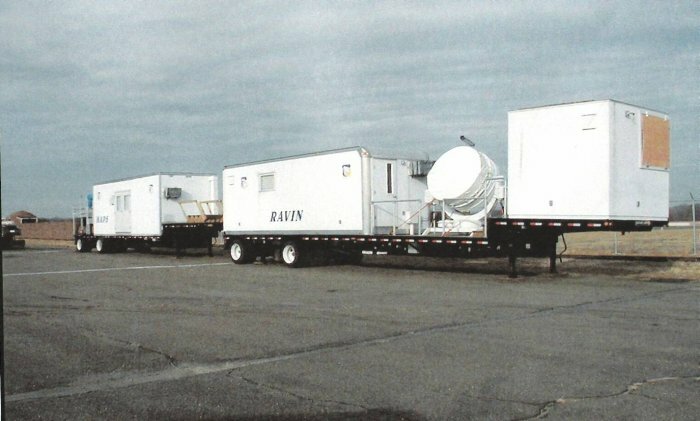 MAPS and RAVIN at Westover AFB in 2003. This is the last time that MAPS and RAVIN are seen together. MAPS returned to Eglin AFB and Ravin was reconfigured as the RAVIN-SL5. The search light was located on the tongue of the low bed trailer, after the tracking mount and its enclosure were removed. RAVIN returned to Telaxix/Millivision during the winter of 2003. Credit: Photo courtesy of Doc Ewen.